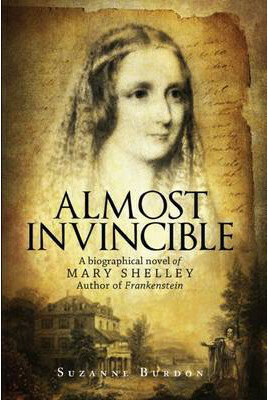 Suzanne Burdon, Almost Invincible: a biographical novel of Mary Shelley. Criteria Publishing, 2014. Pp. 339. ISBN 978-0-9923540-0-8. £12.99. These are, of course, Mary Wollstonecraft Shelley, author of Frankenstein, the poet Percy Bysshe Shelley, whom Mary was to marry following the suicide of his wife Harriet, and Claire Clairmont, who threw herself at Lord Byron and was treated appallingly by him. You couldn’t, as I say, make it up: even the bare facts involve the complicated relationship novelist/philosopher William Godwin, his second wife, their children, and Shelley; and, especially the tangled and fractious relationship between Mary and Claire which is very much the focus of this novel. Just about everything seems larger than life. The celebrated “competition” during which, in Byron’s Villa Diodati in the summer of 1816, the four (plus Byron’s doctor, Polidori) decide to each write a ghost story is obviously central, and Shelley’s tragic death in a storm at sea in 1822, leaving Mary to bring up their young son in the shadow of a series of wrangles with her disapproving father-in-law and the demands of her own feckless father is of course a suitable climax; but there are other aspects of this tangled history which cry out for further exploration. Mary’s life, moving from being the muse of the age’s brightest star to the mother of a mildly eccentric country gentleman (who wisely resisted all pressure to follow in his father’s footsteps), was fascinating. (She herself eventually repudiated many of her husband’s political and religious views.) But Claire’s was even more so. Often looked upon, as she seems to come across in Burdon’s novel, as immature, petulant and turbulent (which she certainly was), she lived a long and sometimes troubled life as a woman often at odds with the increasing conventionality of her time. Scarred by her encounter with Byron and the death of their daughter Allegra (also in 1822) she nevertheless fiercely guarded her independence and it could well be argued that she was the one of the four who kept their ideals alive. For the third time: you couldn’t make it up. But so many of the events in the saga are either bitterly fought over, or remain capable of multiple interpretations. Did Shelley and Claire actually sleep together? Was Shelley’s suggestion that Mary have a liaison with his friend Thomas Jefferson Hogg an affirmation of the ideals of free love, or a rather creepy suggestion made by someone who could have ended up fronting a sleazy cult? Was the suicide of Mary’s half-sister Fanny brought about by her own love for Shelley? It’s a story that calls for dramatisation, and this isn’t the first time its characters have appeared in fiction. One of the problems with Almost Invincible is that its tone—which largely focuses upon the personal rivalry between Mary and Claire—sometimes falters upon the need for retelling as fiction stories which already have been revealed in all their naked drama by biographers. Thinking of this, we are surely drawn right into Mary’s heart, and it’s a desperately painful place. Burdon presents this in conversation with Hogg in a scene which is rather rushed (it’s perhaps significant that discovering the baby was in fact dead, not sleeping, Mary did write frantically to Hogg for comfort), and it comes across as a retelling in which the poignancy and anguish loses its force, and the scar it gave to the psyche of a woman who had grown up in the shadow of a mother’s death is never really hinted at. More successful is Burdon’s depiction of Shelley’s reaction to his wife’s suicide: a clever piece of selection in which Shelley’s confession of guilt for his behaviour also places the blame upon Harriet for not being open enough to being “enlightened” by him. Nevertheless, despite these difficulties, the story which Burdon is retelling in Almost Invincible is so strong that it would be almost impossible to throw it away. Burdon’s selection of the particular time-frame and relationships is important, and she wisely tells the story we know, and equally wisely tends not to over-Gothicize it. It oscillates between the two great Mary Shelley novels, Frankenstein and The Last Man, and focuses upon the years between the first “elopement” to Europe and the death of Shelley. Although we can read the story as a romance between the Shelleys, made more interesting because of their status as writers (Burdon captures effectively the way they encouraged each other), the tension is between Mary and Claire. Mary is the central character whom the author is clearly in love with—but then, who cannot fail to be? Claire here is Mary’s rival: a constant foil whose anger and obsessiveness and insensitivity is always shattering relationships. She is—in this reading—what she is often seen to be: the weaker and rather nastier part of a group of brilliantly talented and sensitive idealists who, as such groups often do, wound themselves up into a love-hate relationship in the middle of personal tragedy. And this is certainly the teenage Claire, though I tend to feel that it’s a somewhat unfair portrait: while she remained volatile throughout her life, later accounts of her show a remarkably strong, often generous, and determined woman. She’s the mystery Burdon doesn’t solve. But then, history has not solved her either. While Almost Invincible doesn’t quite convince, it’s a novel which is certainly worth reading by anyone fascinated by the persons and personalities behind that strange event in Switzerland which resulted in the writing of a novel that can been seen as the invention of science fiction, an angry novel of feminism, a tragic meditation about parenthood, and much more besides. It remains a compelling story. In the wake of Brian Aldiss's "Frankenstein Unbound," the appearance of this novel with a very different focus on Mary Shelley seems fascinating. I look forward to getting a copy, and to getting time to read it!